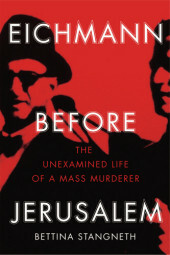 A total reassessment of the life of Adolf Eichmann, revealing his activities and notoriety following the collapse of the Third Reich and permanently undermining Hannah Arendt's often-cited notion of the 'banality of evil'.A New York Times Notable Book of 2014Smuggled out of Europe after the collapse of Germany, Eichmann managed to live a peaceful and active exile in Argentina for years before his capture by the Mossad. Though once widely known by nicknames such as 'Manager of the Holocaust', he was able to portray himself, from the defendant's box in Jerusalem in 1960, as an overworked bureaucrat following orders - no more, he said, than 'just a small cog in Adolf Hitler's extermination machine'.How was this carefully crafted obfuscation possible? How did a principal architect of the Final Solution manage to disappear? How had he occupied himself in hiding?Drawing upon an astounding trove of newly discovered documentation, Stangneth gives us a chilling portrait not of a reclusive, taciturn war criminal on the run, but of a highly skilled social manipulator with an inexhaustible ability to reinvent himself, an unrepentant murderer eager for acolytes to discuss past glories and vigorously planning future goals." Eichmann before Jerusalem is history at its best. Meticulously researched, compellingly argued, engagingly written. Bettina Stangneth confronts Hannah Arendt's notion of the 'banality of evil' with important new evidence and nuanced insight, permitting a fresh and informed reassessment of this riven debate. Arendt would surely have applauded the Stangneth challenge" Timothy W. RybackBettina Stangneth, geboren 1966, studierte bei Klaus Oehler und Wolfgang Bartuschat in Hamburg Philosophie und promovierte 1997 über Immanuel Kant. Stangneth ist Herausgeberin einer kommentierten Ausgabe von Kants Religionsschrift und bekam für ihre Studie über Antisemitismus bei Kant 1999 den ersten Preis der Philosophisch-Politischen Akademie e.V., Köln. Seit sechs Jahren forscht sie zu Adolf Eichmann. Bettina Stangneth beriet den NDR bei dem Dokudrama Eichmanns Ende (2010), das auch aufgrund ihrer Forschungsergebnisse gedreht wurde, und ist u.a. wissenschaftliche Beraterin der Ausstellung zum Eichmann-Prozess in Berlin 2011 (Stiftung Denkmal für die ermordeten Juden Europas, Topographie des Terrors, Stiftung Wannsee). Sie lebt in Hamburg.